Mikki Dog Boots are used for foot protection whilst out and about or for sole use to cover a foot dressing or wound protection. Abonded Vinyl upper with a non slip PVC sole. Sizing of the product allows for your dog to wear a dressing. Reduce size if not wearing a dressing. 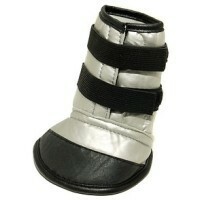 This product contains one weatherproof dog boot for temporary protection of an injured paw. It is not intended for prolonged use. Size 5 St Bernard's, Great Danes and other large breed dogs ! Had to return - bought size 2 for my 25kg Rough Collie but she stepped out of it! The straps are far too long and going twice around her leg there is no velcro left to attach! Foot was still very big for her and she could have done with smaller size but didn't want to have to mess about restitching the Velcro. Admittedly she didn't have bandages on though - it was to stop her scratching a skin infection.